An Author Has Been Commissions to Write the First-Ever NOVEL Based on STRANGER THINGS! Shocker. Her name's Gwenda Bond, posting on her Twitter recently about the fantastic opportunity. It'll be a prequel novel debuting next Spring detailing the life of Eleven's mother Terry and how she locked horns with the MKUltra program back then. Of course, what you see above is what would be season II in book format (it's fake). But wouldn't it be cool to see it like this? You love those books from way back, their style. It's the equivalent of VHS covers! 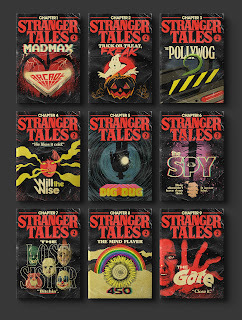 This is all thanks to Netflix's collaboration with Penguin Random House for a worldwide publishing deal, expanding the STRANGER THINGS multiverse into the stratosphere with everything from the written word to an audiobook. There will be more coming. Remember: this is a deal Netflix made with Penguin Random House. Want to know about more of the awesome literature coming out, plus other fun STRANGER THINGS stuff? JUST CLICK HERE.